Most flowering plant species, including those under cultivation, are pollinated by animals. The passion flower (Passiflora setacea DC.) 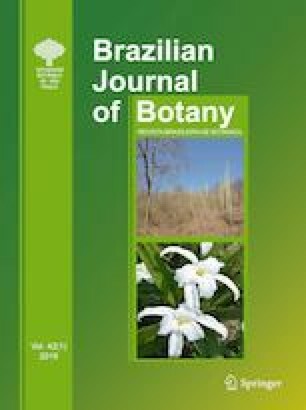 variety BRS Perola do Cerrado is apparently dependent on pollinators for the production of its fruits; however, very little is known about its reproductive biology. The present work analyzes the periods of flowering and fruit production, and the morphology, floral biology, visitors and pollinators of P. setacea, as well as the effect of pillagers on its fruit production. The study was carried out between April 2015 and December 2016 on a farm located in the Brazilian Cerrado. Passiflora setacea blooms throughout the year and produces fruit for several months. The greatest fruit production occurs during the off-season of commercial passion flower (Passiflora edulis Sims) fruiting. The flowers of P. setacea depend on bats for pollination; they open in the early evening, are white and are produced in considerable amounts every day. Glossophaga soricina (Pallas, 1766) has been considered the effective pollinator of P. setacea, although its flowers also receive daytime floral visitors such as bees, wasps and birds. The bees Apis mellifera (Linnaeus, 1758) and Trigona spinipes (Fabricius, 1793) are pillagers of P. setacea flowers, but do not interfere with fruit production. Passiflora setacea fruits from manual self-pollination are not adequate for commercialization, and the species relies on pollinators for the production of quality fruits with seeds and pulp. In the absence of natural pollinators, farmers should perform manual cross-pollination using pollen from different plants. It is also important that genetically related individuals be kept far from each other in the same plantations. We thank Elisabeth Ferreira Guimarães Lima and Telmo Alves Lima for allowing us to work on their property and for giving us support during data collection. This work was supported by CAPES (scholarship to T.P.O.T., I.N.M.F, J.P.R.). The authors have no conflict of interest to declare. TPOT conducted fieldwork, gathered and analyzed data, and contributed to writing and discussion of manuscript. INMF and JPRB conducted fieldwork and contributed with the discussion of manuscript. CMS contributed to data analyses and discussion of manuscript. EVF and HMT supervised the study and organized the structure, writing and discussion of manuscript.